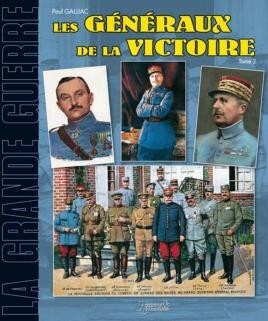 This work offers thirty or so concise but precise biographies of French World War I Generals. All ranks of generals rub shoulders, from the simple brigadier to the generals destined to become Maréchals. Some are famous; others renowned in their time are now unknown to the general public. Unfortunately, due to sales rights restrictions, we cannot offer Generaux De La Grande Guerre for sale in your country. This work offers thirty or so concise but precise biographies of French World War I Generals. All ranks of generals rub shoulders, from the simple brigadier to the generals destined to become Maréchals. Some are famous; others renowned in their time are now unknown to the general public. The reader discovers the different careers, both typical and unusual, which enabled these men to reach this rank; there is also information which goes against the grain of generally accepted ideas. All the generals are mentioned, from the generals of the "14 Generation" to those of 1918, who advanced because of the conflict; also discussed are the various sackings, the different contexts and the spirit of the times; the clans, the different schools, skills and negligence, political affinities and their influence; the generals who fell at the front and the true faces of men praised or reviled by History, all with anecdotes and details still as yet unpublished. This study, the first of its type, is captivating from beginning to end and is complemented by unpublished pictures; it enables the reader to put faces to the names of the main protagonists of the Great War; it's all about the men from all walks of life who, far from forming a rigid caste like their counterparts on the other side of the Rhine, reflected the diversity of French society at the time. An undisputed specialist of 20th Century French Army history and a former officer, Paul Gaujac served in the paratroopers, in the air transport command, at the nuclear submarine headquarters and then at that of the Army, finishing his career as head of the Historical Department of the Armée de Terre. He has published twenty works, three of them with Histoire & Collections.